If you really want to grow in your faith then you need to serve other people, starting at your church. Put these verses together and what you get is that we need to actively share our faith and serve other people. The more we give of ourselves to serving Jesus by serving others the closer we will grow with God. So serve others. 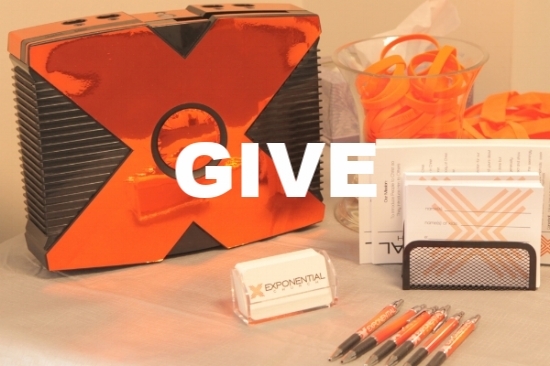 At Exponential Church we want our Exponents to serve here at church and in our community. Start getting involved and see your relationship with God and others grow. Join one of our ministry teams. Ready to take the next step in volunteering? Contact us or fill out a communication card at church and drop it in the Xbox. Yeah, I’m talking about money. But it’s important. Money was one of the most discussed topics by Jesus. Why? Because if there is anything that we let get in the way in our relationships with God and with others, it is money. If God truly comes first in our lives then He should in our finances. It really is simple. Where we give of our time and our money indicates what we give priority in our lives. If you don’t want to become attached to your money then detach yourself from it, give it away. Malachi 3:10 and 2 Corinthians 9:6-8 teach that we should give to God and to others and that we should give generously. When we do, God promises to take care of our needs, not only that, but we are allowed to test Him in this one and only respect. So practice generosity, grow in your faith, and give.